as promised, one more peach recipe before apples & pumpkin spice start taking over the blogosphere! this one features white peaches & coconut in the most delicious clafoutis. 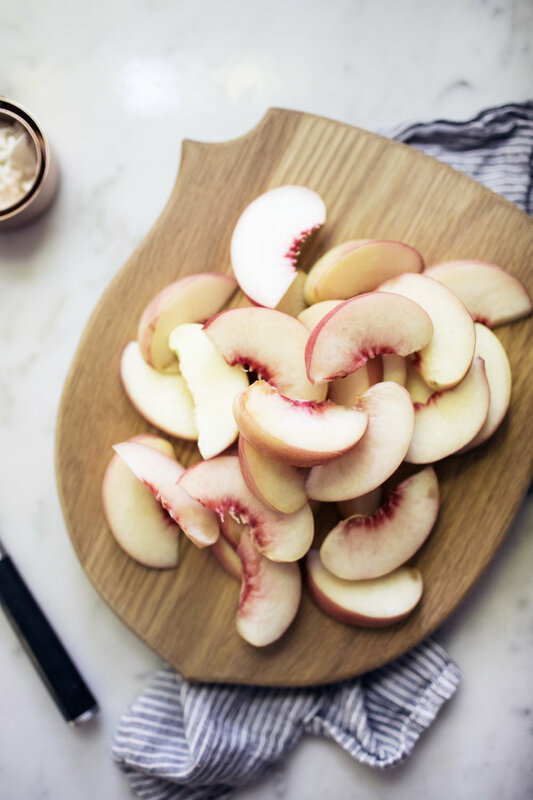 the white-fleshed peaches tend to be less acidic & a little sweeter then a regular peach. 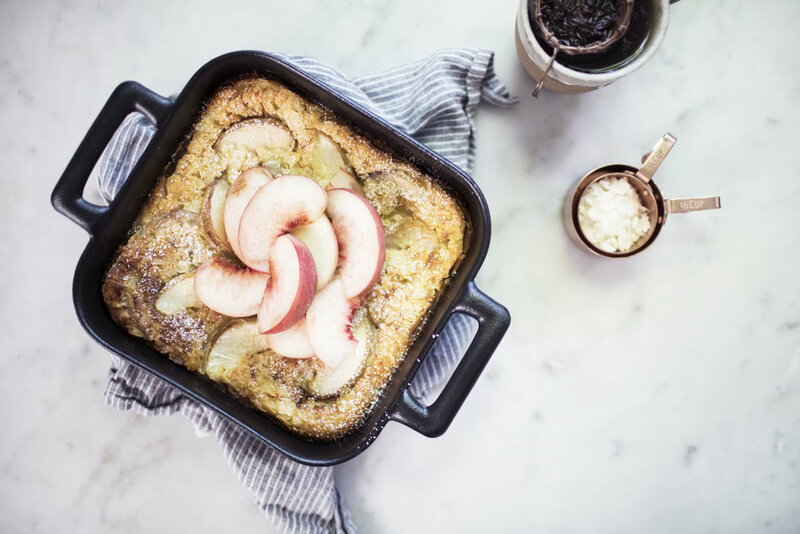 as for the clafoutis, this dish can be served for both breakfast and dessert! when serving it for dessert, i like to top mine with a generous dollop of sweet whipped cream or vanilla ice cream. if you are not familiar with the clafoutis, it is a rustic french baked dessert that features fresh fruit (typically cherries) & a custard-like batter. 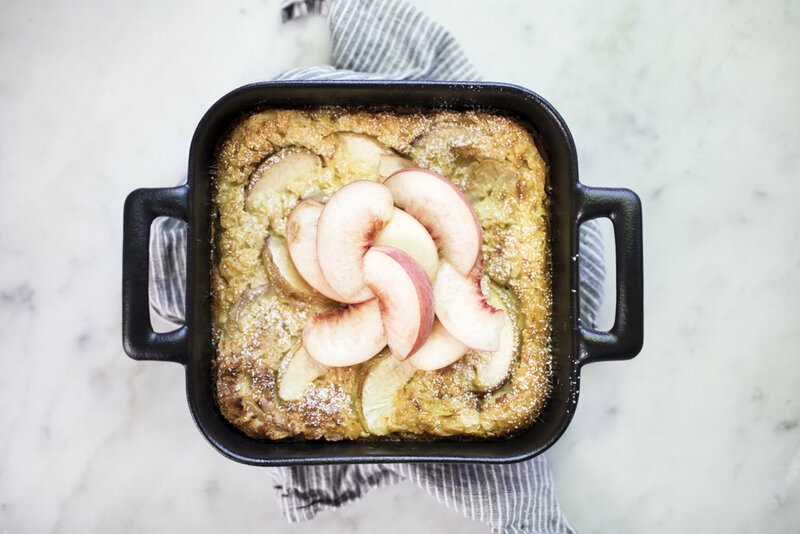 the clafoutis is a simple dessert to make that gets served right from the baking dish! i like to make these year round & switch up the fruit to match the season. to add a little extra wholesomeness to this version, i used half bob's red mill all-purpose flour & half whole wheat flour. i love the rustic flair the whole wheat flour adds to a dish. plus, it makes things a little healthy when baking with a whole grain flour. 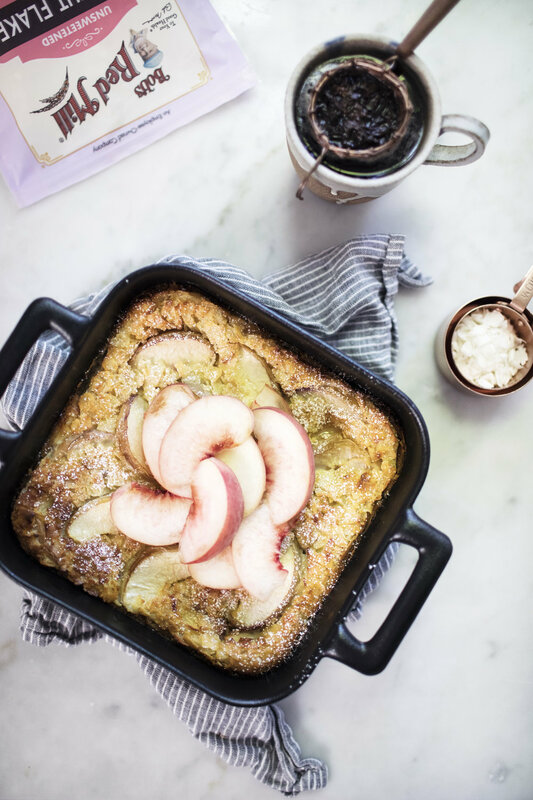 so celebrate the last couple weeks of peach season by baking yourself a clafoutis! preheat the oven to 350 degrees. grease an 8-inch round or square baking dish with butter. in a blender add the eggs, sugar, cream, milk, butter, flours, vanilla, salt & nutmeg. blend until smooth, about 60 seconds. let batter rest for 15 minutes. fold in the coconut. pour half of the batter into the prepared baking dish & bake for 10 minutes. 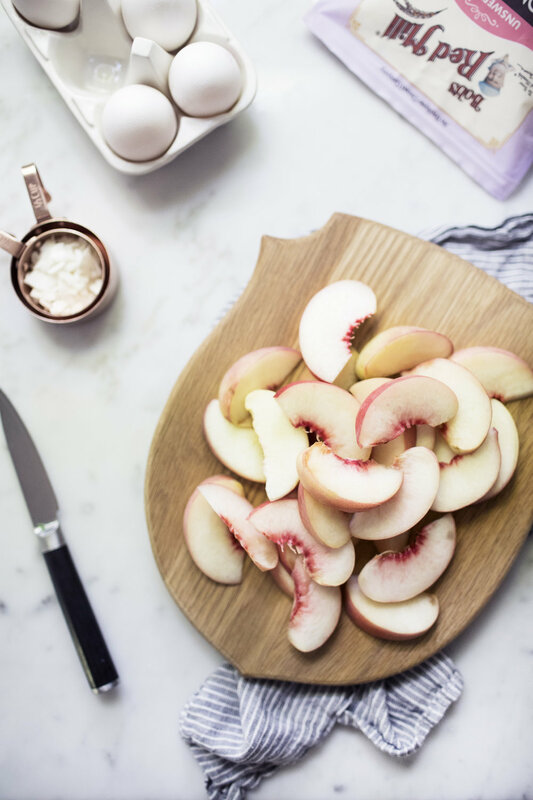 carefully remove the baking dish from oven and scatter in the peach slices, covering most of the surface area. pour remaining batter over the peaches & bake for an additional 45 minutes, or until the clafoutis is golden on top. let cool for 15 minutes. dust with powdered sugar, top with additional sliced peaches if desired & serve!